On January 16, the head of Harvard University’s astronomy department, Prof. Abraham Loeb, gave an interview where he defended his controversial paper that the interstellar object detected by a Hawaii based telescope on October 19, 2017, and named “Oumuamua”, was a spacecraft of some kind. 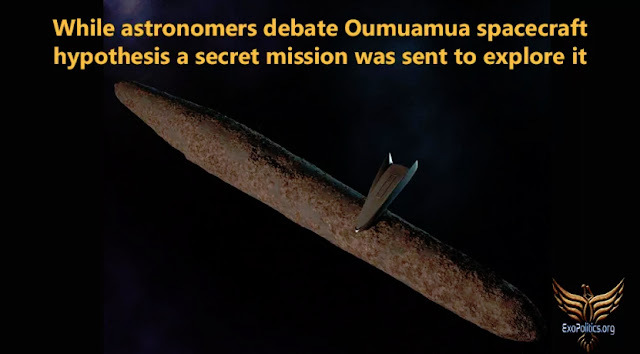 While astronomers continue to debate the scant scientific data gleaned from telescopes to determine Oumuamua’s origins and nature, a whistleblower/insider’s report of an alleged covert space mission to Oumuamua that acquired much scientific data after landing on it is being ignored. While astronomers might be forgiven for ignoring insider/whistleblower reports of covert missions to artifacts in the solar system due to a lack of corroborating scientific data, political scientists interested in space affairs, which falls under the rubrics of “astropolitics” or “exopolitics”, do not have such a luxury. Insiders/whistleblowers provide a rare glimpse into the rarified world of highly classified compartmentalized projects and therefore their claims need to be investigated since corroborating evidence may be absent due to the classification process, rather than being non-existent. If found to be credible insider/whistleblower claims need to be analyzed with regard to available scientific data as outlined in a 2014 paper published in the Astropolitics Journal. Before examining the alleged covert mission that landed on Oumuamau, it’s worth reviewing what astronomers have said about it to date. In a TED talk published on July 19, 2018, the astrobiologist, Dr. Karen J. Meech, discussed what was known about Oumuamua which was given the formal designation of 1I/2017 U1. She explained the excitement of astronomers who had long awaited the arrival of the first object from another solar system. They initially gave it the informal name of Rama, after the derelict spacecraft depicted in Arthur C. Clark’s 1973 novel, Rendezvous with Rama that was spotted after passing close by the Earth. Meech explained in her TED talk that this was not deemed suitable. As will be later explained, the name Rama was in fact very appropriate given how a secret space program organized a landing mission. Given that the interstellar object was discovered from the Pan-STARRS telescope on Haleakala Observatory on the Hawaiian island of Maui, two Hawaii culture experts were consulted. They named it Oumuamua – Hawaiian for “scout or messenger from distant past reaching out to us”. The images taken by the Hubble and Pan-STARRS telescopes were quite faint, so not much could be learned about Oumuamua’s geometry and composition. Nevertheless, the initial artist depiction was of it being a long-cigar shaped object that was turning and rolling along its interstellar orbital path as though violently ejected from some distant stellar event that occurred in the remote past.